This Talking Atomic Sports Watch clearly announces time, date, and more in a male voice. Automatically adjusts for standard and daylight savings time, and also can be adjusted for Pacific, Mountain, Central and Eastern time zones. Easy to customize alarm, hourly time announcements and more. Large 1-1/8" diameter face. 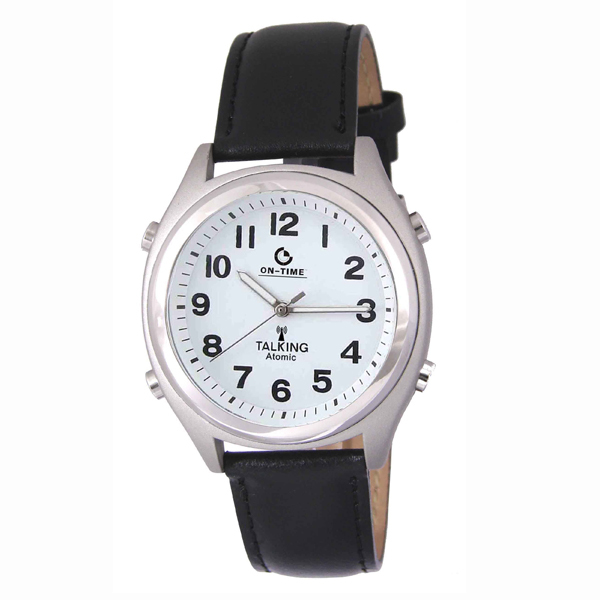 Leather band, white face with gray case and dial. Please note: The atomic function will not operate in Hawaii or Alaska. This item cannot communicate with the National Institute of Standards and Technology from either Hawaii or Alaska and therefore must always be set manually while in those states. For individuals who use this watch in either Hawaii or Alaska, time will not be automatically set and the calendar will not work. However, it may still be used in those two states as a regular 'manual - set' watch, but the calendar will not function at all. * Large 1-1/8" diameter face with bold black numbers.